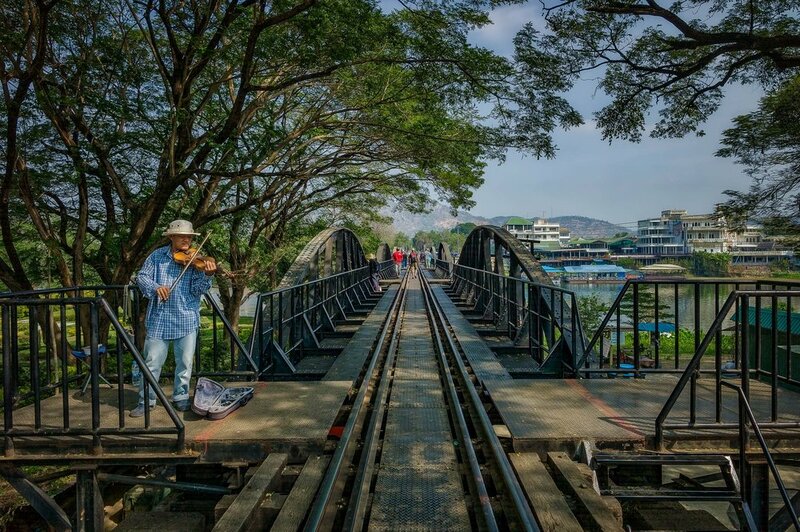 A busker playing violin on the Bridge On The River Kwai near Kanchanaburi in Thailand. Made famous due to the movie The Bridge on the River Kwai and made infamous through the treatment of Allied prisoners of war, local Thais, Burmese, Malayans and others by the Japanese Military during World War II, the Bridge On The River Kwai is now a major tourist site near the town of Kanchanaburi in Thailand. The film is fictitious but borrows from the building of the actual Burma Railway, also called the Death Railway, during 1942 and 1943. A beautifully restored mercedes benz in the museum alongside the Bridge On The River Kwai near Kanchanaburi in Thailand. My visit to the Bridge On The River Kwai was part of a day-long tour out of Bangkok. As I run my own photography tours its important for me to check out how most tourists experience such places. Which tends to mean the day is all about picking people up, often from a variety of different hotels, getting to restaurants at meal time and then onto organised shows and performances, prior to being bundled into a large, overly priced gem or carpet outlet. Invariably, as was the case with this journey to The Bridge on the River Kwai, you're bundled out of your mini bus in bright, midday light and given a relatively short period of time to take in the atmosphere and make your photos. What's more you're expected to put up with a pretty poor historical account of the site in question, often in an accent that you can barely understand. If I want to know dates, linages and building dimensions I'd consult a guide book, either before or after I visit the site. I'm there to experience and photograph a location, not to stand attentively while some walking, talking guide book drones on. 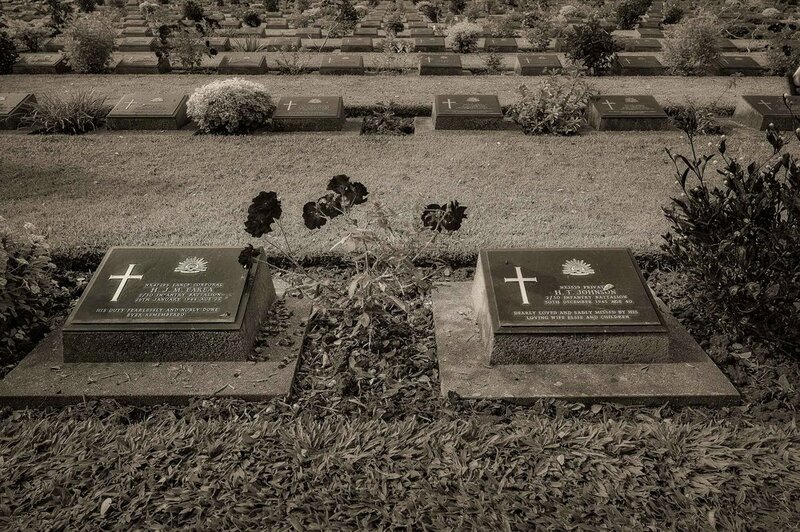 Grave stones at the beautifully maintained Kanchanaburi War Cemetery in the town of Kanchanaburi, Thailand. I met an Aussie couple earlier in the day at a very well kept Allied War Cemetery. The girl's grandfather was buried at the cemetery and she was their to locate the grave and pay her respects. Given the day was somewhat of a pilgrimage for her, I felt sorry for the lack of time she'd have for the experience. Fortunately she located the grave and paid her respects before the bus moved on. It ended up being a very emotional experience for her. Death Railway Museum and Research Centre alongside the Bridge On The River Kwai in Kanchanaburi, Thailand. As a photographer my focus was quite different and my concerns were all about trying to make decent photos during the middle of the day. The quality, direction and, sometimes, color of the light are crucial to your success. But while I'm there I need to maximize my time so as to make great photos and most organized tours simply don't cater to the needs of the keen photographer. A train driver bringing a train safely across the Bridge On The River Kwai near Kanchanaburi in Thailand. The photo at the top of this post was made under harsh light during the middle of the day. I was barely given time to walk along the length of the bridge before it was time to return. I made a few quick pics on the way back, squeezing up against the railing as a train passed over the tracks. The bright sunlight cast strong shadows and dappled light over the scene. I had to use quite a few tricks, in both exposure and processing, to produce an acceptable result that was still true to how I remembered the location. But it would have been so much easier and, co-incidentally, far less crowded if I'd been there early or later in the day photographing under more beautiful light. The trick, therefore, is to do all you can to be where you need to be at a time of day that produces the best results. Unfortunately, that's not going to happen by signing up to an average (non-photography) tour. Still, it's better than nothing. Just be prepared to compromise and make the most of the opportunities that come your way.